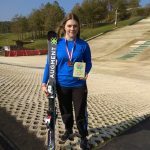 Earlier this year Nicole received a letter from Snowsport England informing her that once again she had met the criteria to be an England Dryslope Ambassador, which she was very pleased to accept and will take on again the responsibilities this title gives. Nicole has also kicked off the new season with her ski sponsor Croc, re-branding their product to “Augment”. For the company, this means increased performance, effectiveness and customer care. The only difference for Nicole is a name change on the front of the ski. Training on dendex surface has always been an issue for Nicole over the last few years. 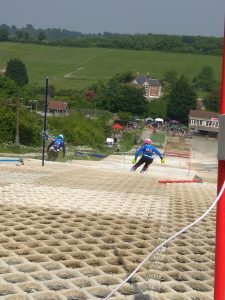 Team Snowtrax her local club has proslope matting and is very different to the slopes she competes on around the country and the slope is much shorter in length. This has not been too much of an issue in the past, but now the gap is starting to close within the top female racers, so Nicole really needs coaching of the highest level and time on dendex. She really enjoys coaching the younger racers at Snowtrax, they also see Nicole as a role model and as an England Ambassador she wants to encourage all dryslope racers to succeed. She has also recently asked to take on the role of joint Head Performance Coach, which is quite an honour and at such a young age. So moving away from the club was not an option. 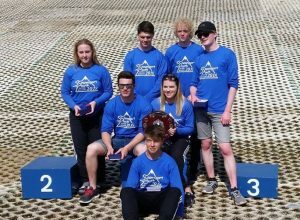 In the last few weeks a solution has been found with the support of the head coach at Team Snowtrax and Aldershot Ski Race Club. 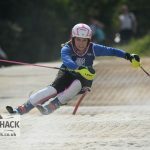 Nicole is now able to train at Aldershot and will represent ASRC at National, GBR and International races and can continue to coach at Snowtrax and represent this club at local regional races. Nicole is most grateful to both clubs for this outcome. So with everything in place moving forward, it was time to start racing. 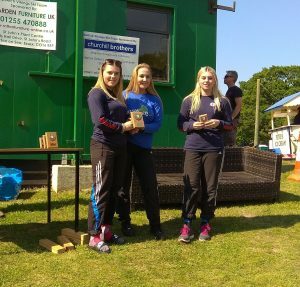 Nicole’s first outdoor race was a trip to Wales, Pembrey. It’s always good to get the first race under your belt and win always helps too. 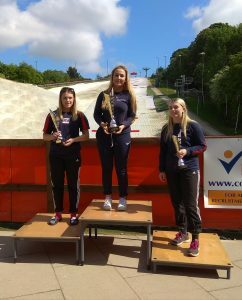 Nicole was 1st U21 and fastest female overall. 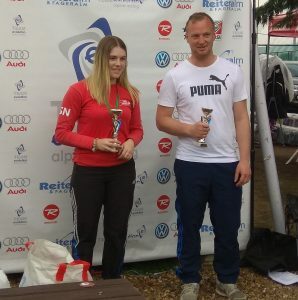 The following weekend was a trip to Welwyn for the Eastern Regional Race, this was more of a race to get time on dendex and hitting poles than the girls who had entered. Nicole finished 1st U21 and fastest female – with a combined time of 0.69 faster than the 2nd place female. A long drive to Pendle in Lancashire followed with many more “seeded” racers attending the Pendle and NWSF Club Nationals weekend, so more competition for Nicole. 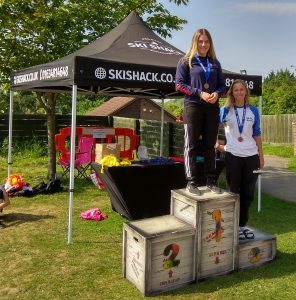 After putting down three solid runs on both days, Nicole came away with four medals/trophies for 1st U21 and 2nd fastest female on Saturday and Sunday 1st U21 and fastest female. Bank holiday weekend in the sunshine of Stoke was a three day event. 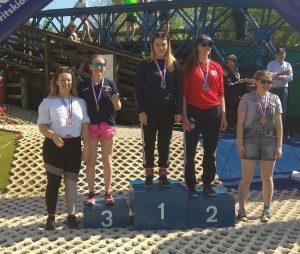 On the Saturday was the Midland Club National, Sunday the first GBR Series race and Monday the Inter Regional Championship. Nicole continued her winning ways. 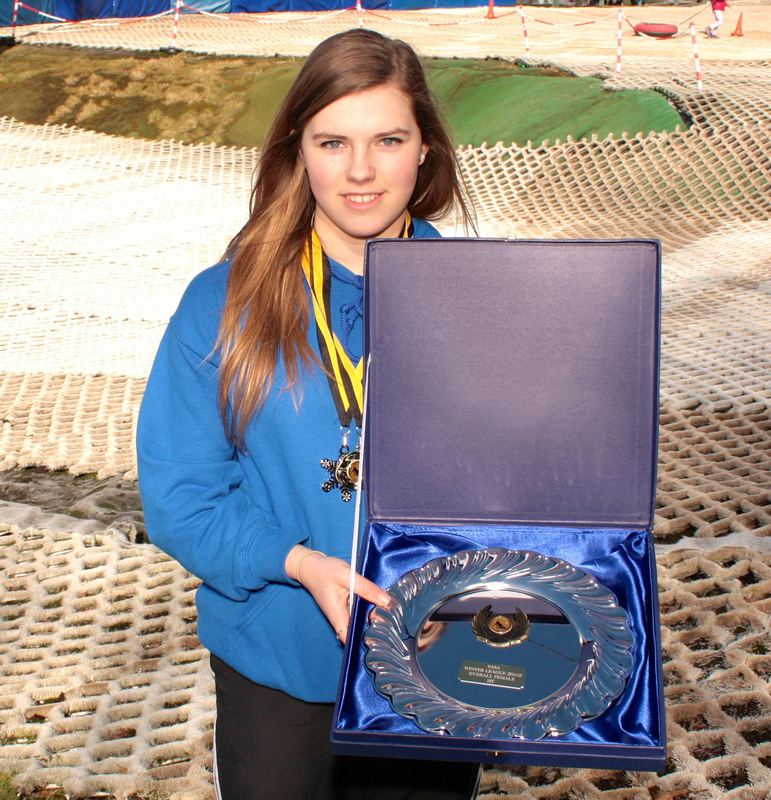 1st U21 and fastest female on Saturday and Sunday with Snowsport South A Team winning the Inter Regional shield. 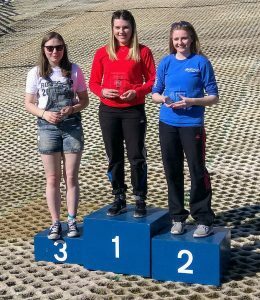 After a very sunny weekend, it was then a trip to Manchester’s Chill Factore for the GBR Indoor Race 1 and 2. This is not Nicole’s preferred surface but still likes to compete at these races. 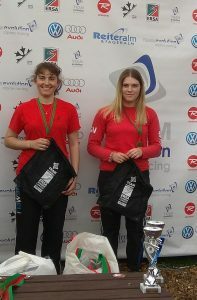 Saturday Nicole was 4th in the U21 category and Sunday 3rd. It was back to the sunshine the following weekend! Norfolk Club National, Norwich and Viking Club National, Ipswich. Another double header between Nicole and her closest rival. It’s great entertainment for the watching crowd to see two girls each week battling it out for the female overall title. The girls always encouraging each other out the start gate before each run and a hug at the end, be it a win or 2nd place. On Saturday after run 1 and 2, both girls had the exact same time, so the 3rd run determined a place on the top of the podium or to the side…unfortunately it was not quite Nicole’s day and was 0.08 seconds slower on 3rd run so she took the 2nd spot for overall female but was U21 1st place winner. The Vikings race was once again very close after run 2 Nicole was 0.05 behind the 1st place, so the 3rd run had to be quicker, which it was and both girls ended up with exactly the same overall time, which is very unusual for this to happen. There was room on the podium 1st place for two, but the trophy had to be decided by rock, paper, scissors! Nicole won…. The final race in May was during the bank holiday weekend, at Chatham, for the Snowsport South Round 2 race. 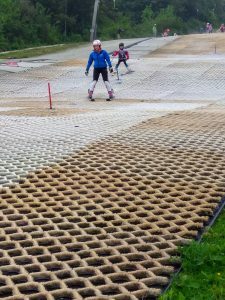 Nicole had not skied here before and the slope has also recently been re-furbished, so a new challenge and much longer in length than many she has tried and tested before. It was head to head time again… The fastest time over 3 runs is the format for this type of race. Nicole got faster with each run, but was not quite enough to beat her Aldershot teammate, who’s first time was quickest of her 3 runs, Nicole was 0.09 slower, again another very close race. As the day progresses and the sun shines the slope does “dry” out so can be a factor, getting a really fast time on run 1 can be the difference between a podium place for some racers. 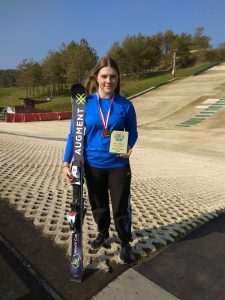 Nicole will be heading back to Chatham again this weekend, as she is participating in a Snowsport England UKCP Coaching level 1 course for three days. After completing the course and workbook modules, she will then have another ski qualification to her name.